Progressive Music Advocates for Music Education in Washington, D.C.
McKeesport, PA – May 30, 2017 – Last week, local area business leader, Mark Despotakis, Director of Market Development at Progressive Music joined nearly 100 music industry leaders, notable artists and arts education activists to advocate for all school-aged children to have access to quality, comprehensive school music education programs. As part of the National Association of Music Merchants (NAMM) Advocacy Fly-In, held May 22-24, the delegation met with Members of Congress and other policy stakeholders to reinforce the importance of music as part of a well-rounded education. The issue of music education takes on a special importance this year as the Every Student Succeeds Act (ESSA), signed into law in 2015 by President Obama readies for state-level implementation in 2018, currently faces underfunding. The law specifies music as core part of a well-rounded education for all K-12 students. The Advocacy week began on Monday, May 22, where Despotakis joined The NAMM Foundation in awarding the SupportMusic Champion Award to Senator Robert Casey (PA). The award was presented in recognition of the Senator’s long history in music education advocacy and role as a champion of the Every Student Succeeds Act. 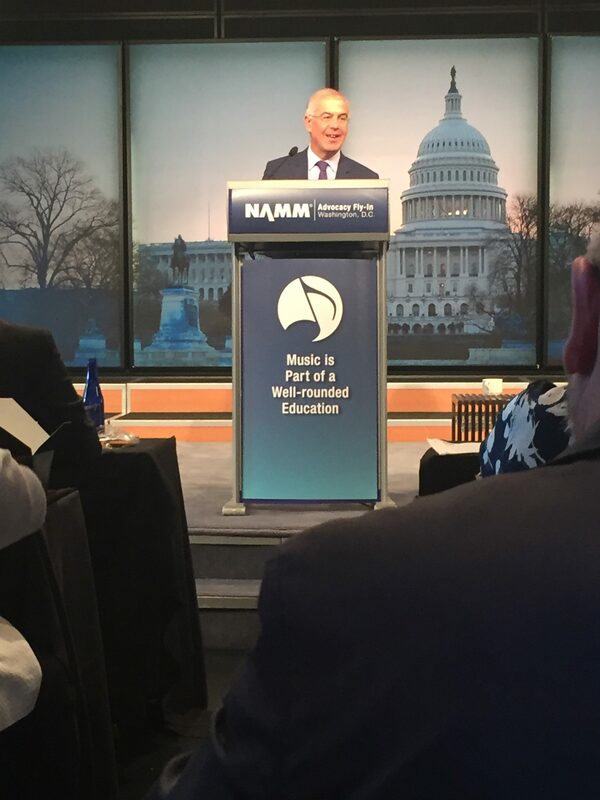 New York Times columnist, David Brooks, addresses music education advocates. lunchtime session on current policy trends presented by PBS News Hour contributor, New York Times columnist and Turnaround Arts artist, David Brooks. Despotakis was also trained on developing state-level advocacy efforts for music and arts education to put into practice here in Pennsylvania. In addition to working with NAMM, Progressive Music and Despotakis specifically work with the Pennsylvania Music Educators Association (PMEA) and the Pennsylvania Arts Education Network on state level education policy issues. 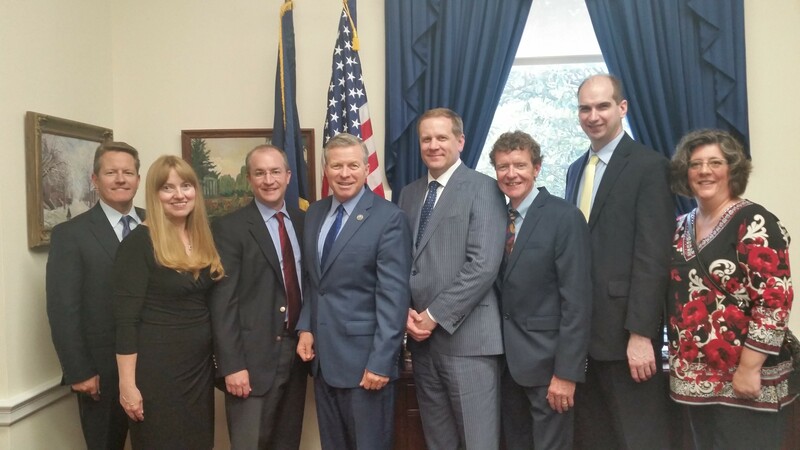 Members of the Pennsylvania delegation meeting with Congressman Charlie Dent. Joel Menchey (Menchey Music Service), Cindy McAllister (Martin Guitar), Peter Sides (Robert M. Sides Music), Congressman Charlie Dent, John McElroy (Martin Guitar), Chris Martin (Martin Guitar), Mark Despotakis (Progressive Music) and Beth Schiemer (Brighton Music). programs across the nation and to discuss the multitude of benefits music education espouses such as increased brain function, focus and language development, as discussed in a new research study from Northwestern University. The Country Music Association, VH1 Save the Music Foundation, and former New York Yankees centerfielder and three-time World Series winner, music education champion and Turnaround Arts artist Bernie Williams joined the day of advocacy, sharing his own experience in music education and a desire to create a more musical world. In addition to the advocacy work, Despotakis was part of a special Congressional reception, held on Wednesday, May 24 in the Mansfield Room at the U.S. Capitol that brought together arts advocates and policy makers. The National Association of Music Merchants (NAMM) is the not-for-profit association with a mission to strengthen the $17 billion music products industry. NAMM is comprised of approximately 10,300 member companies located in 103 countries. NAMM events and members fund the NAMM Foundation‘s efforts to promote the pleasures and benefits of music, and advance active participation in music making across the lifespan. For more information about NAMM, please visit www.namm.org, call 800.767.NAMM (6266) or follow the organization on Facebook, Twitter and YouTube.